The Annual is a great addition to any collector's or researcher's library. The Annual features over 250 pages of unique research by Society members supported by scores of quality reproductions and historical reprints. In publication since 1990, these volumes have become a prime resource for daguerreian and other 19th-century photography study and appreciation. They are indexed/abstracted by the J. Paul Getty's Bibliography of the History of Art and ARTbibliographies Modern. Current and back issues of our annual can be purchased though the Daguerreian Society Store. 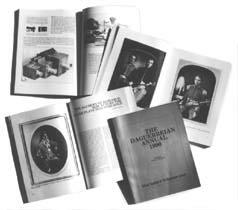 Back issues of the Daguerreian Annual are available for $40 to Society members, $55 to non-members. Annuals from 1995 through current are also available in hardcover at $70 each to Society members, $85 to non-members. A shipping charge will also apply. Contact our office to order. The Daguerreian Society welcomes and encourages authors to submit original articles or other material for publication in the Daguerreian Annual. Updated guidelines for manuscript submission can be gotten from the Publications Committee. Feel free to contact us if you have any questions. For full details of terms, rates and layout requirements for advertising in the Annual contact Diane Filippi at info@daguerre.org.